This article is about the real world locations in which games are released. For the areas in the Pikmin series, see Areas. Due to the different cultures and languages in the world, some aspects of the Pikmin games had to be changed in each region. These changes are more pronounced in Pikmin 2, where the in-game treasures are actual items in the real word, and due to the cultural differences, not all players would recognize the objects and brands existing in the original Japanese version of the game. There are three main game release regions: Japan, United States of America, and Europe. The Pikmin games are released all over the world, but there are only three main versions for each, one focused on each region. Nintendo EAD's headquarters are located on Kyoto, Japan. As such, the development of each game is done in Japanese and consequentially, the first version to be released is the Japanese one. Either shortly before release or after, the game is then sent to be localized for the United States (by Nintendo Treehouse) and Europe. More than just a translation of the Japanese game, some graphics, sounds, scripts or objects may be altered in order to fit the culture of the region. This holds true for the Pikmin games. For all three main titles, the Japanese version is developed first, and content is then altered to suit the American and European fan base. The Australian version uses the European changes. 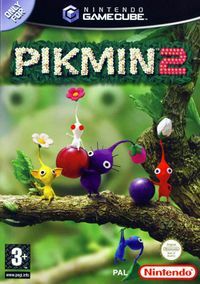 The European boxart for Pikmin 2, with the word "PAL" on the bottom-right. Commonly, the words "NTSC" and "PAL" are used to describe the different regional versions of the game. These terms are, however, partially incorrect, as the words themselves refer to the color encoding systems used for analogue television. In order to play a specific version of a game, the television must match the color encoding. This has since been discredited for the Wii U onward with the use of HDMI cables. For the most part, the US uses the NTSC system and Europe and Australia use the PAL system. The boxart of the European and Australian versions of the Pikmin games also contains the word "PAL" next to the Nintendo logo, as do most GameCube and Wii games. These factors helped popularize the use of the terms "NTSC" and "PAL" to categorize the game regions, inadequate as they may be. Japanese: J, JAP, JP, NTSC-J. United States: U, US, USA, NTSC, NA (North America). Europe: E, EU, EUR, PAL. Australia: A, AU, AUS, O, OC, PAL. This article or section is a short summary on the regional differences in the games. In order for the games to be enjoyed in several places along the world, the in-game text is written in a different language, depending on the version that's being played. The Japanese version of the Pikmin games has Japanese text, the US version has English text, and the European version has the ability to choose between English, Spanish, Italian, French and German. Another common change between versions is the boxart: the front normally contains a logo in Japanese or English, and the back contains text in Japanese, English, or the aforementioned European languages. It's also quite normal for the English used in the European version to be British English, but this isn't always the case (the European name for the Armored Cannon Beetle Larva is the same in Pikmin 2, but the first word is localized as "Armoured" in Pikmin 3) – even the same game can alternate between American and British spelling. Other types of changes can exist for several reasons. One persistent difference that became standard for the European version of Pikmin games, starting on New Play Control! Pikmin, was the rename of Wollywogs, Yellow Wollywogs and Wogpoles to Wollyhops, Yellow Wollyhops and Wolpoles, respectively. The reason for this change is likely due to Nintendo assuming that British players would find the term "wog" offensive. Regardless, the enemy reel in New Play Control! Pikmin was not updated to reflect this. In the case of Pikmin, it was decided before the European GameCube release that skipping the sunset cutscene by pressing would be convenient, so that feature was added for that version of the game. All regional versions of New Play Control! Pikmin also allow skipping the cutscene. In addition, the Japanese version contains an option on the main menu that allows the player to toggle between a "child" mode and an "adult" mode; the former makes the text easier to read. Finally, the Secret Safe requires 85 Pikmin to carry it in the Japanese version, and 40 Pikmin in the other versions. A glitch was also solved in the US and European versions: the sunset cutscene softlock. Because of the way screen refresh rates work, Pikmin is one of the few games that runs at a slower framerate in the European version, running at only 25 frames per second in-game, as opposed to the 30 frames per second framerate of the other games (besides Pikmin 3). Comparison between the Japanese, US and European icons for denchi_2_red. During development, Pikmin 2 needed more than just a translation, so that the in-game treasures would reflect items familiar to each region's culture. An example would be the treasure with the internal name denchi_2_red: in the Japanese version, this corresponds to a red battery of the Japanese brand "National Hi-Top". During localization for the US, it was likely decided that there were too many batteries in the game, and that the American players would not recognize the brand, so this treasure was instead replaced with a lid of Ragú pasta sauce. For the European version, it was assumed that European players would not recognize the Ragú sauce brand, so the treasure was replaced with a PscHitt! lid. The differences between the game's treasures are better detailed on the treasure article. While most treasure changes in Pikmin 2 come in the form of including items that are familiar to the players on each region, there are a few changes that have been enforced due to potential controversies. One of the most noteworthy examples is Pikmin 2 is the Arboreal Frippery: in the Japanese version, Olimar's notes hint at it actually being a marijuana leaf. In the US, this reference was removed, but the leaf's green color was kept. Finally, in the European version, the leaf changed color entirely, in order to remove any and all similarities to the drug. The reason for these changes comes from each region's views on drug-related themes. At times, treasures are changed not because of cultural differences, but presumably, because they were deemed too uninteresting. For example, the treasure with the internal name kan_b_gold is a simple popsicle stick in the Japanese version, and was changed to a tube of lipstick for the following versions. In the Japanese version, e-Reader support exists, which had been removed for the other two releases. In the Japanese version, the "Hocotate" in Hocotate Transportation Company is written as "Hokotate", which is the way it is written in Japanese. In the Japanese version, the intro cutscene lacks The President's face next to the money counter after the Hocotate ship counts the value of the bottle cap. The Nintendo logo when the game is booted up is blue in the Japanese version, and red everywhere else, as is the norm with some Nintendo games. The Silencer's value was changed from 666 Pokos in the Japanese version to 670 in the other versions, in order to remove the relation to the number of the Beast from the biblical book of Revelation. The sign on the landing site of the Wistful Wild is a stop sign in the Japanese version, as stop signs are triangular. This was changed to a Yield sign in the other releases, so that the triangular shape would not be changed. In the Japanese version, the Beady Long Legs' feet can be damaged by any Pikmin type. In all other versions, only a Purple Pikmin's stomp can inflict damage. The Spherical Atlas and Geographic Projection have their models rotated in each version. For the Spherical Atlas, this makes it so that the version's region is shown on-camera by default. If the Volatile Dweevil on the Piklopedia is petrified just before exploding, that causes a freeze in the Japanese version, but kills the creature in the overseas releases. In the US and European versions, the Wistful Wild sunset theme's melody was changed to use flutes instead of a music box. This only lasts for one loop though, before the game uses the music box like in the Japanese version. Interestingly, none of the New Play Control! versions of the game have this melody change, and they all use the music box like the Japanese GameCube version. On the saved game selection menu, there are two labels explaining what / do. The buttons are represented with the normal letters "X" and "Y" inside bubbles in the Japanese version, while the US and European versions use the GameCube button icons. For the New Play Control! Pikmin 2 versions, the and icons are similar between all versions, but a bit simpler in the Japanese version. In the Japanese version, a wild Pikmin can be sent to its Onion if there are 100 Pikmin on the field and the game needs to spawn a new sprout from an extinct type. In the US and European versions, wild Pikmin are not eligible to be removed from the field in this scenario. The word "monstrous" in the Flare Cannon's entry in Olimar's journal is written that way in the US version, but misspelled as "monsterous" in the European version. The same happens in the Wii release, except the two regions have the words swapped. The ship's dialog on the Brute Knuckles was fixed for the European release to correctly call the Exploration Kit item "Rocket Fist", instead of "Rocket Punch". This change only exists in the GameCube version, since the Wii release uses the correct "Rocket Fist" in all regions. Olimar's journal entry for the Fleeting Art Form does not have a space between the word "out" and the word "The", in the US version of the Wii release. The European version, as well as all GameCube releases, do not have this typo. The US Wii version of Olimar's journal on the Patience Tester uses the same low-quality text as the Permanent Container in the GameCube version. The Activity Arouser is called "Activity Booster" in the European Wii version. The Frigid Series is called "Frozen Series" in the European Wii version. The Lustrous Element's entry in Olimar's journal calls Hocotate "Hokotate" twice, in the European GameCube version. Olimar's journal on the Utter Scrap uses the text "I was able to open up some new areas for exploration" in the European Wii version exclusively, and uses "to exploration" instead in all other versions. Olimar's journal entry for the Vorpal Platter writes "could effortlessly sheer through the armor plating" in all versions except the Wii European one. That one uses the correct word "shear". Louie's notes on the Ranging Bloyster contain the text "an herb". However, the Wii European version fixes that to "a herb". Olimar's notes on the Orange Bulborb say "with deep orange body" in all versions but the Wii European release, which writes "with a deep orange body" instead. The scientific name of the Dwarf Red Bulborb is Pansarus pseudoculii russus in all versions of Pikmin 2 except for the Wii European release, which uses two 'o's in the species name. Since all other breadbug mimics use two 'o's, the single-o'd spelling is presumably a typo. Olimar's notes on the Glowstem have the misspelling "resemblence" in all versions but the European Wii release, which uses the correct "resemblance". In the European version of Pikmin 2, the rules for 2-Player Battle say, for the boulder item: "Boulder drops on opponent". The US version, as well as all GameCube versions, say "Boulders drop on opponent" instead. While not regional differences, it is worth pointing out that some treasure notes have a notably lower quality compared to every other treasure, exclusively in the European version. This is due to the numerous typos as well as the arguably confusing English. These problems were later spotted by Nintendo, and some were resolved for the New Play Control! release, in the form of typo fixes and full rewrites. For a list of such treasures, see this category. Like in Pikmin, Pikmin 2 also has an option to swap between katakana/hiragana and kanji. This page was last edited on February 19, 2019, at 16:09.